Over the past few seasons, Chase Hansen has been one of the better defensive players in the Pac-12, only his play was at strong safety. Hansen was often asked to play down in the box at linebacker depth in the Utah Utes’ defense, a role he thrived in. The Utes talent in the secondary continued to get deeper around him, so much so that during the offseason the coaching staff decided that they could get more of their talented secondary players on the field at once if they moved Hansen to linebacker pushing Marquise Blair into the starting strong safety role. This isn’t anything new to Hansen and even wasn’t the first time he has been asked to change positions. Hansen’s career at Utah began with a redshirt season as a quarterback before leaving on a two-year mission. He returned to the Utes and was subsequently moved to safety. 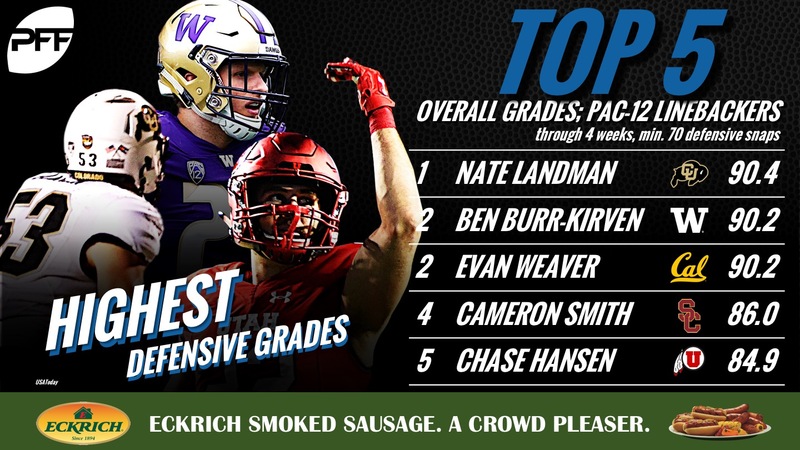 This feature on Utah S Chase Hansen is brought to you by Eckrich, the Official Smoked Sausage of the College Football Playoff. Hansen’s first year as a starter came as a sophomore safety in 2016 and he made an impact right away. As a coverage defender, Hansen was targeted 42 times and allowed 21 receptions for 202 yards with no touchdowns, three interceptions, two pass breakups and opposing quarterbacks had a 34.0 passer rating when throwing into his coverage. As a junior in 2017, Hansen (missing five games due to injury) was targeted 18 times and allowed 10 catches for 62 yards with one touchdown, one interception, one pass breakup while opposing quarterbacks had a 58.1 passer rating when throwing into his coverage. Hansen surrendered only 0.35 yards per coverage snap in 2017, which ranked 23rd among returning FBS safeties heading into this season. Seeing something in him to make the switch to linebacker, Hansen has been a productive blitzer when given the opportunity. In 2016, Hansen had two sacks, six QB hits and six hurries on 41 pass-rushing snaps for a 26.8 pass-rushing productivity rating, ranking No. 1 among all FBS safeties. In 2017, Hansen had one sack and four hits and his pass-rushing productivity rating of 19.0 ranked No. 7 among all returning FBS safeties. He has always played the run like a linebacker and has been a sure tackler. As previously mentioned, he often was aligned at linebacker depth when he played safety and a season ago, Hansen played 94.3% of run snaps within eight yards of the line of scrimmage. Hansen’s previous second-level usage has made his transition to linebacker look easy. Hansen took to the position switch to linebacker by not only retraining his brain but his body as well. Hansen added weight during the offseason to help him take on offensive linemen on a more regular basis and play closer to the line of scrimmage and is now playing at 230 pounds. Through three games this season, Hansen is grading positively at all three aspects of linebacker play: run defense, pass-rush and coverage. He currently has an 85.1 overall grade which ranks him No. 18 among all FBS linebackers who’ve played at least 20% of their team’s defensive snaps. He is an athletic coverage defender in addition to being an effective blitzer against the pass and has one interception – a pick-six in Week 2 against Northern Illinois when he jumped a slant route – and opposing quarterbacks have a lowly 49.5 passer rating when throwing into Hansen’s coverage this year. Hansen also has gotten home as a pass-rusher so far this season. Currently, he has two sacks and four QB hits on his 22 pass-rush snaps. Also benefiting from the position switch, Blair currently has an overall grade of 77.4 which ranks No. 37 among all FBS safeties. Together, Blair and Hansen each rank in the top 40 at their position in the nation. Hansen’s switch has benefitted the Utes’ presently and also his future NFL prospects. Hansen’s size and play style is reminiscent of Nate Gerry when he played safety at Nebraska. The Philadelphia Eagles moved Gerry from safety to linebacker after they drafted him as that is where his skill set was better suited to the NFL and Hansen’s NFL position. Hansen has graded positively in coverage all four seasons at Utah and a linebacker with safety coverage ability has never been more welcome in the modern NFL. Hansen’s high football IQ, knowledge of multiple defensive positions and coverage ability will help serve him well as what the NFL used to refer to as a sub-package coverage linebacker or as they are called now, linebacker.